Lately I have been traveling so much that there hasn’t been even a semblance of normalcy in my life. The result has been that I have hardly been cooking meals at home and when I do cook, I haven’t had the time to take pictures, write the recipes down and then upload everything on the website. 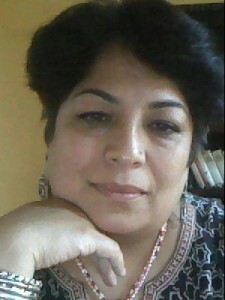 First, I went to Turkey for a vacation, then I had to drive down to Indiana (from Washington DC) to drop my daughter off to college, then my son had to be dropped off to his college and then I went to India for two weeks. All this hectic travel took place over the course of six weeks and the result of it is that I am completely exhausted and am dying to just lie in bed for the next six weeks and hibernate like a bear. Of course, the fact that we have had a winter from hell with snow storm after snow storm doesn’t help matters either. So lately I have been feeling quite uninspired as far as cooking goes. Yes, I did get amazing things to eat during my various trips (Turkish food is REALLY good) but cooking at home has taken a back burner (HAHA – I made a cooking related joke!). 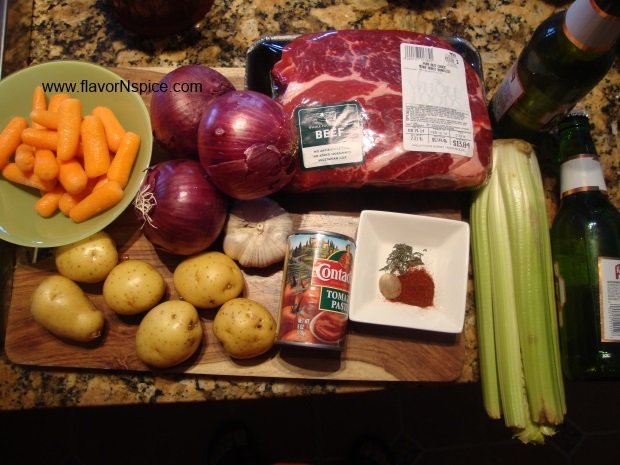 Anyway, now that we are snowed in yet again, I had to go back to cooking and in this awful cold and grey weather what could be better than a hearty beef stew. This stew had a base of Lager beer and even through two hours of cooking the stew had a good bitter aftertaste that got rounded out by the sweetness of onions, carrots and potatoes. It made for a great meal with soft buttered brioche bun on side. 15. A pinch of red pepper flakes. 1. In a large heavy bottomed pot, add the olive oil and heat at high heat. Add the hunk of meat in it. 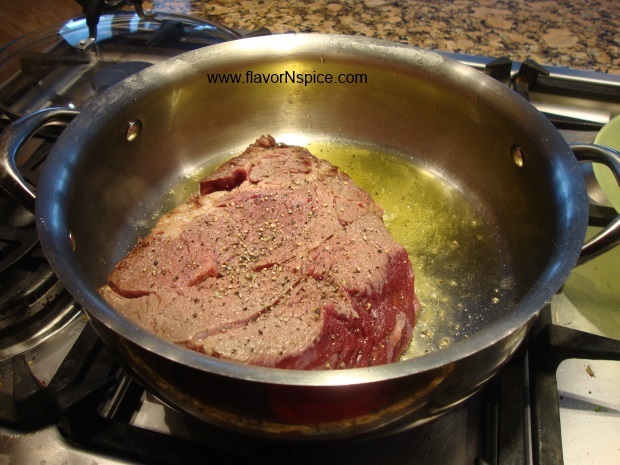 Add salt and pepper on both sides of the meat and cook it on both sides for 3-4 minutes each. 2. 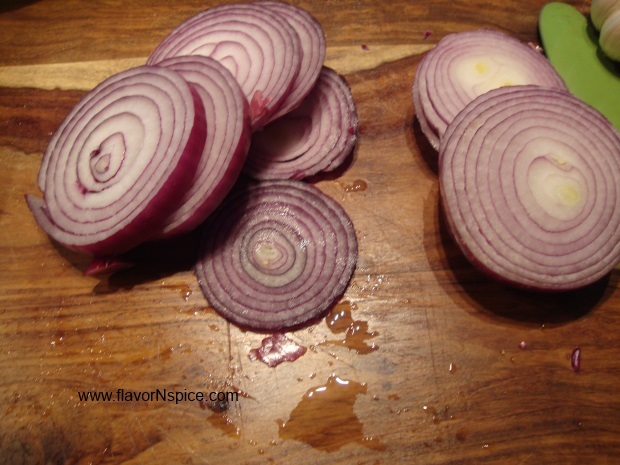 Peel and slice the onions and the garlic. 3. 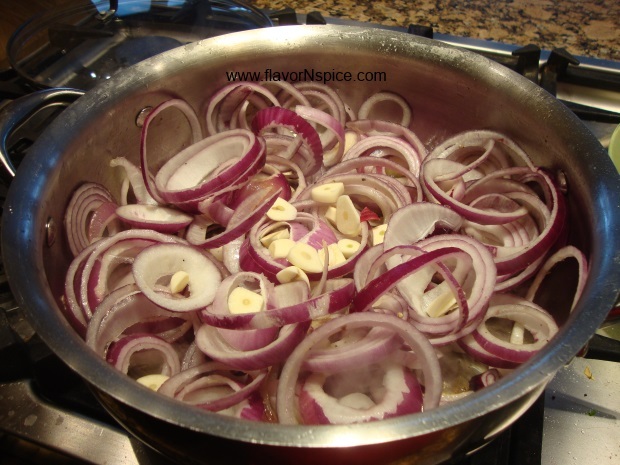 Take the meat out of the pot and keep it aside and add the onions and garlic to pot and let them cook for about 8-10 minutes on low heat. Stir frequently. 4. 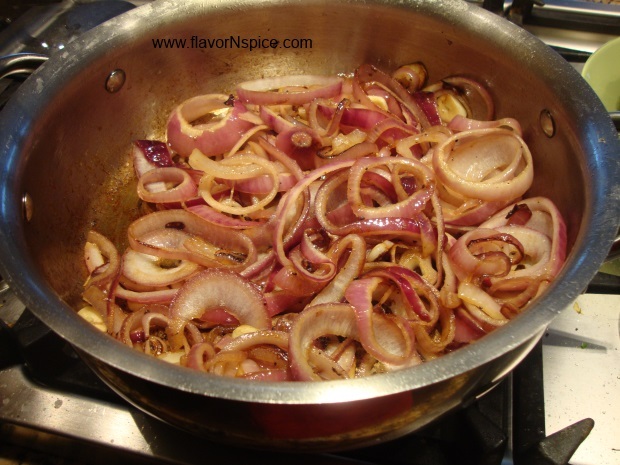 When the onion slices look a little translucent, add the hunk of meat back to the pot (on top of the onions and garlic) and then pour the two bottles/cans of beer to the pot. Add the paprika and thyme to the pot. Cover it and let it cook on low heat for about 60-90 minutes. You can also use a crockpot for this. 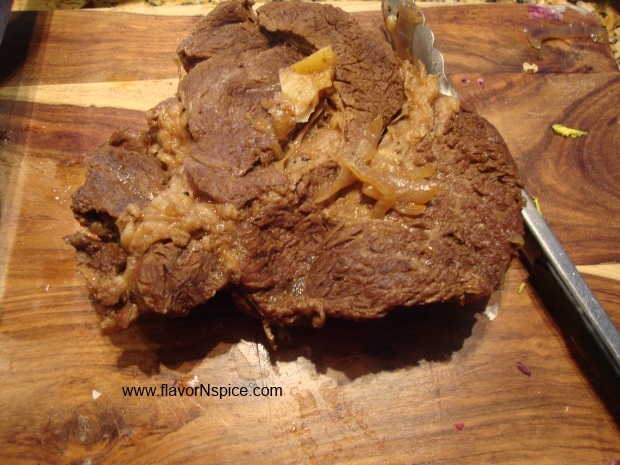 Check on the meat after every 15-20 minutes to make sure that there is enough moisture to continue cooking it. If it looks like the liquid is dwindling, add a bit of chicken stock to the pot (I did not need to add any because there was plenty of beer to begin with). 5. Wash and cut the celery into large pieces about 3 inches long (do not cut the pieces too small because you have to later fish this out of the stew). 6. Wash and cut the potatoes in big chunks. 7. 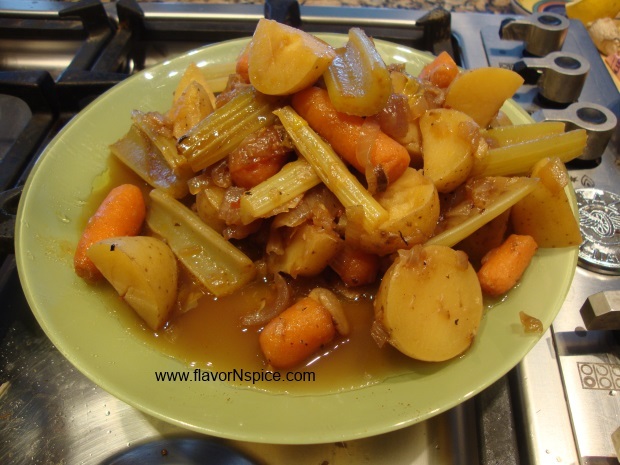 Add the cut celery, carrots and potatoes to the pot. Also add the tomato paste and cover and let the stew cook for another 25-30 minutes on low heat. 8. 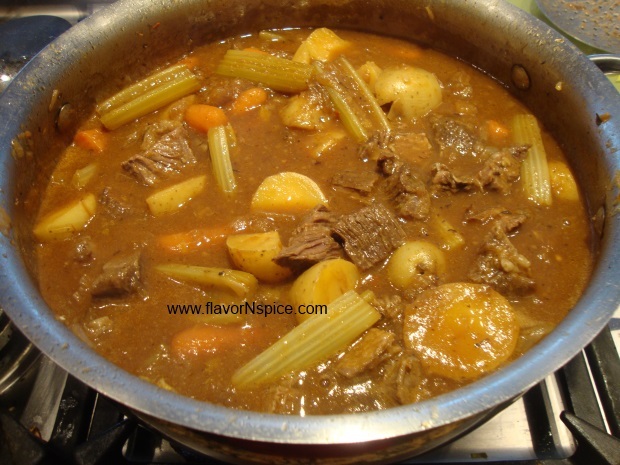 When the vegetables and beef are cooked and look for tender, take them out of the pot and set them aside (take out the potatoes, carrots and celery). 9. Also take out the hunk of meat and cut it in bite sized pieces. 10. 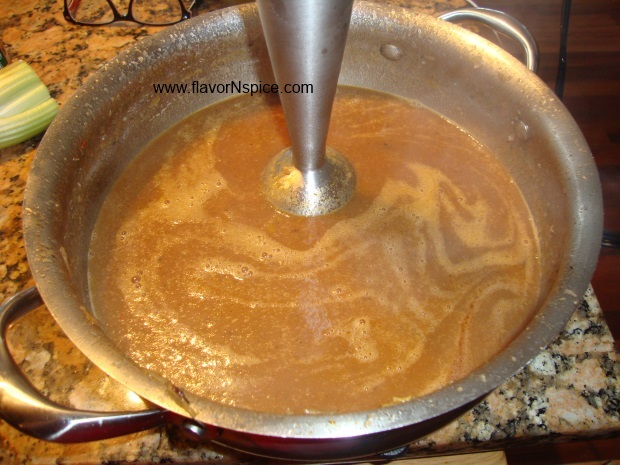 With an emulsion blender, blend the stew sauce in the pot to a rough thick consistency. 11. 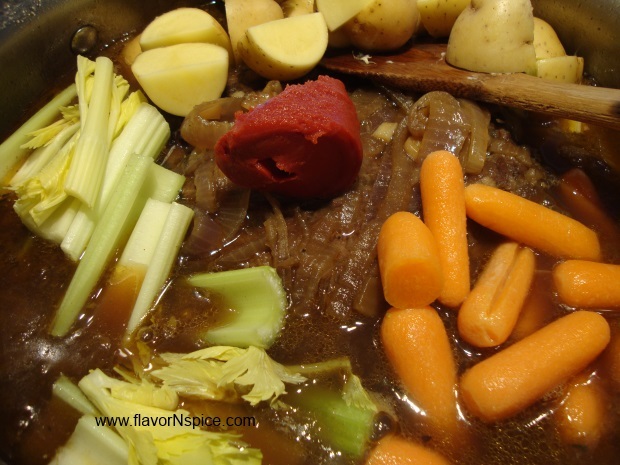 Add the cut pieces of meat and vegetables back to the pot. 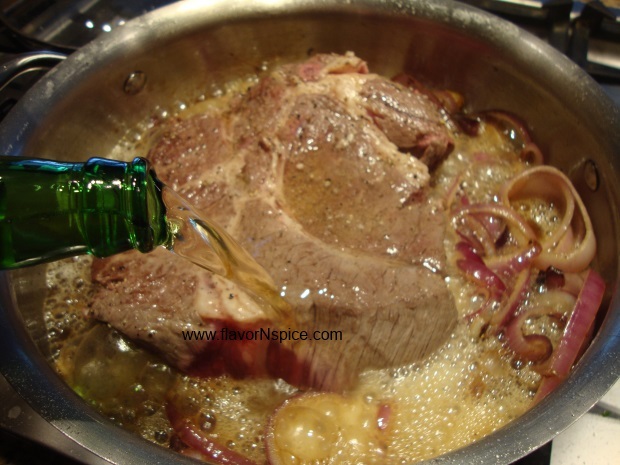 Add the Balsamic vinegar and stir everything together and cook for another 10-12 minutes on low heat. 12. 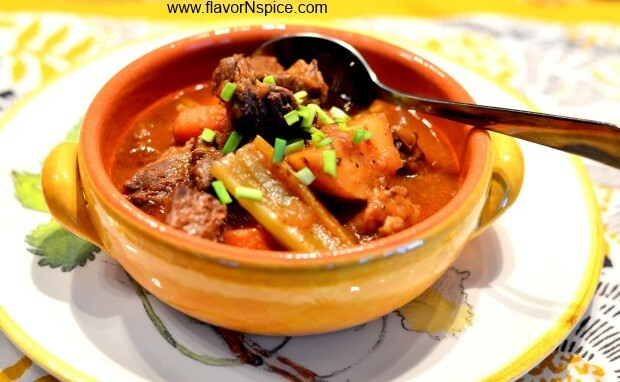 Serve while the stew is piping hot with some good bread or rice on the side. That has comfort written all over it! Looks delicious! Hey, welcome to my page Adam 🙂 yes, it was pure comfort food – and given the awful winter we’ve been having, I needed the warmth of a hearty stew!! !